A drawing of a map from Florence to the west, showing a scheme for making a canal to run via Pistoia and the pass at Serraville, to meet the Arno again at Vico Pisano. The sheet has been pricked for transfer. The river Arno is not navigable to sea-going vessels as far as Florence, due to rapids ten miles west of the city. 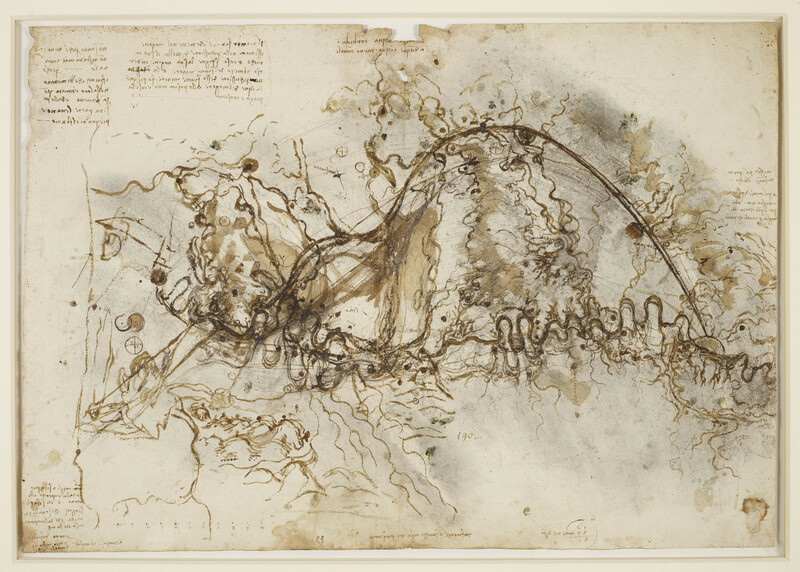 Around 1503 Leonardo proposed bypassing this stretch of the river with a canal, as studied in this vigorous and unusually rough drawing. The canal passes in a long sweep from Florence circled at the right of the sheet via Prato and Pistoia, through a pass in the hills to the north, before rejoining the Arno near Pisa. There is no evidence that Leonardo’s plans were ever detailed enough to consider putting them into practice.